Relatives: Bashenga (Ancestor), Chanda (Ancestor), Azzari the Wise (Grand Father), S’yan (Uncle), Ramonda (mother), T’Challa (1/2 brother), White Wolf (adopted brother), Jakara (Cousin, deceased) Storm (Ex-Sister in law ), T’shan (Cousin). Skills and abilities: Skilled martial artist trained from birth. Powers: All her physical attributes have been enhanced beyond peak human by the heart-shaped herb and she has a mystical connection to Bast The Panther God. After her walkabout in The Djalia she has unspecified magical powers. She has displayed the ability thus far to dis-corporate into multiple Crows travel great distances and then reassemble. What other powers she has have not been revealed yet. Shuri is the second biological child of Black Panther T’chaka and the one child of second wife Ramonda. From an early age Shuri has taken a keen interest in the mantle of the Black Panther despite being the youngest child and not being expected to ever sit on the throne. As princess of the Warrior nation of Wakanda she was trained from birth in armed and unarmed combat. On a diplomatic meeting to the Americas her father was assassinated by Klaw when she was struck unconscious by a bit of debris allowing her father to be distracted and leave himself open in order to protect her [Black Panther (2005) #3]. This training only became more feverish after this and her mother more protective. Her only goal was to become the black Panther. As she and her brother were not of the age to assume the throne her uncle S’yan ruled in their stead. Her brother chose to go to America to continue his learning but she maintained the old ways and remained in Wakanda under her mother’s watchful eye. Shuri waited for her time to challenge her uncle for the mantle despite her mother’s objections of her ever rising to the rank of Black Panther. Her relationship with stepbrother Hunter and the Hatut Zeraze is also unknown. On the day of ascension she was locked away in her room by her mother to prevent her participation. This was child’s play to her as she skillfully made her way to the ring . Before she could challenge her uncle however she found herself pinned down and thus unable to compete allowing her brother T’challa to defeat S’yan and ascend to Black Panther [Black Panther (2005) #2]. Shuri also studied nuclear physics for two years [Black Panther (2005) #4]. Upon returning home in she witnessed an attempted invasion by Klaw aided by Rhino, Batroc and a racist Black Knight [Black Panther (2005) #4]. When the Vibrainum mound begins acting strange she goes against her brother’s wishes and takes a team of scientist into the mound to investigate. While her theory is proven right all the scientists die when the Radioactive man attacks [Black Panther (2005) #4]. She manages to elude the far superior opponent before killing him thus ending the threat to Wakanda‘s treasure [Black Panther (2005) #5 and Black Panther (2005) #6]. Traumatized by her first kill she spiraled for a while and became a wild child like Lindsey Lohan/Britney Spears becoming tabloid fodder and shaming the royal family like none before her [Age of Heroes #4]. Her brother finally comforted her and gave her council as she partied in New York [Black Panther (2005) #10]. She attended the wedding of Storm and T’challa and later bonded with Storm [Black Panther (2005) #18]. When the United States stationed ships close to Wakanda’s waters while the king and Queen had joined the Fantastic Four Shuri was convinced by her friends that she [Black Panther (2005) #26, #27]. When she finally infiltrates the ship she discovers Erik Killmonger and is captured by him [Black Panther (2005) #35]. In a bid to humiliate her, Killmonger unleashed prisoners to do with her whatever they wanted. Though still chained to a wall she managed to kill all her attackers [Black Panther (2005) #36]. By the time Zuri comes to her rescue she had already freed herself and her friend. Her mother was overjoyed at her return home [Black Panther (2005) #37]. rescues her. During the skrull invasion she fights on the front lines [Black Panther (2005) #39-40 and #41]. When her brother is mortally wounded by Dr. Doom she and her mother are both traumatized [Black Panther (2009) #1]. At the behest of her mother a new Black Panther is chosen. While her mother expected queen Ororo to take the mantle instead Shuri is chosen to everyone’s surprise [Black Panther (2009) #2]. Taken to Zuri she is tasked to face the greatest challenges on the path to meet the Pather God. She walked across fire barefoot, dodging arrows and Spears, meditated for six hours in a scorpion filled pit and then she had to climb a mountain without the aid of any equipment. Her finale challenge was eluding twenty-five Panthers while securing the heart-shaped herb [Black Panther (2009) #3]. Her arrogance got the best of her however as she faced the Panther God and requested her blessing instead of asking for it [Black Panther (2009) #4]. Shamed by her god she returned to the physical realm to tell Zuri of her failure. Zuri reminded her that if she was truly unworthy she would have been killed. With Morlun cutting a swath through Wakanda she donned a custom-made Black Panther suit and prepared to protect her brother and her kingdom [Black Panther (2009) #5]. Shuri managed to fend of Morlun long enough for him to be sent to the spirit world and his threat ended. Now more humble and knowing she is meant to serve her people the Panther god finally gave her its blessings [Black Panther (2009) #6]. Shuri next turns his gaze toward the world as she searched for who was responsible for the attack on her brother while letting the world know a new Black Panther protected Wakanda. After meeting Obama and taking with Everette K. Ross her car is attacked. The weapons used were Wakandan in nature leading her to the realization that a faction of Wakandans had gone rogue [Black Panther (2009) #7]. Shuri continued to investigate until confronted with a member of this insurrectionist group, a suicide bomber who let fly their name before his death, The Desturi [Black Panther (2009) #8 and Black Panther (2009) #9]. Her investigation leads her to Namor and her bravado causes them to fight in the middle of the ocean [Black Panther (2009) #10]. The battle is cut short by the arrival of the Fantastic Four. Together they battle Declun’s gathered Superhumans. By the time they defeat them however Dr. Doom allied with the Desturi take over Wakanda. This is exactly what she had planned alongside T’challa however as all their enemies in the kingdom were now revealed [Black Panther (2009) #11–Black Panther (2009) #12]. Journeying to the X-men home Utopia, the duo revealed their plan of drawing the enemy out and then taking back the country. Wolverine, Psylocke, Nightcrawler and Colossus accompanied them back to Wakanda to rescue Storm who had been taken prisoner by Dr. Doom [Doomwar #1]. What follows is a bloodbath in which shuri kills all her enemies both armed and unarmed. Shuri began to enjoy the killing and claimed she had finally found herself despite warning from both Nightcrawler and Wolverine [Doomwar #2]. With Storm rescued and the disagreements with how to deal with the Wakandan insurgents the X-men returned to Utopia. Shuri and her brother then recruited the Fantastic Four as Dr. Doom had stolen all the Vibranium from their vaults and killed her uncle S’yan [Doomwar #3]. Doom used the Vibranium to enhance his robots and Shuri was put in charge of the Dora Milaje contingent who were tasked with defending New York. Shuri and her team were doing fine until Doom activated his own Vibranium power suit [Doomwar #4]. Unconscious on the battle field she had to be rescued [Doomwar #4]. Upon recovering it was her team which discovered Doom’s cash flow deposits and blocked his access to said funds thus preventing him from funding his war. Back in battle alongside Storm they were again overwhelmed but joined by War Machine. Rhodey gifted her and her team with experimental Stark Technology which turned the tide of the battle [Doomwar #5]. T’challa went against her wishes and sent Deadpool and the Midnight Angels into Latveria almost provoking war between their nations. She had her army assembled on the outskirts of Doom’s nation and hovering above his airspace. After T’challa rendered all the processed Vibranium inert and Doom was defeated she returned to Wakanda to rule as Princess Regent [Doomwar #6]. T’challa soon left for America to test himself in Hell’s Kitchen [Black Panther Man Without Fear #513] and Storm returned to the mutant nation of Utopia. Princess Shuri attempts to restore Wakanda to its former economic status by travelling to the Savage Land in order to discuss some Vibranium dealings with Ka-Zar. Upon arriving Shuri found the local wildlife even more savage than anticipated. Alongside Shanna Shuri discovered agents of A.I.M attempting to destroy a cache of the rare element and the Savage Land along with it. Before Shuri could intervene Klaw, master of sound attacks [Klaws of the Panther #1]. Her rage got the better of her and she had to be saved by Storm. Realizing the blood-lust/rage Storm had Shuri contact Wolverine . Joining forces with the X-man they cracked down on Vibranium dealers in Madripoor. Through interrogation they learn of Klaw’s involvement. When he attacks again Shuri is able to gain the upper hand but unable to kill him due to her new restraint [Klaws of the Panther #2]. In New York she tries to enlist the aid of the Avengers but finds Spider-man instead [Klaws of the Panther #3]. Alongside Black Widow, Wolverine, and Spider-man she managed to defeat Klaw and save the world [Klaws of the Panther #4]. At the end of these adventures she manages to learn to control her blood-lust. Shuri next aids her brother against Kingpin who controlled Shadowland in New York as he attempted to buy controlling stake in Wakandan lands [Black Panther The Most Dangerous Man Alive #527, Black Panther The Most Dangerous Man Alive #528 and Black Panther The Most Dangerous Man Alive #529]. Shuri continued to operate as Wakanda’s reigning monarch as Princess regent even after T’challa and Storm worked on their marriage in Wakanda. When the Fantastic four came to visit to aid them with the forces of the Egyptian god Anubis she fiercely defended her people [Fantastic Four #607]. 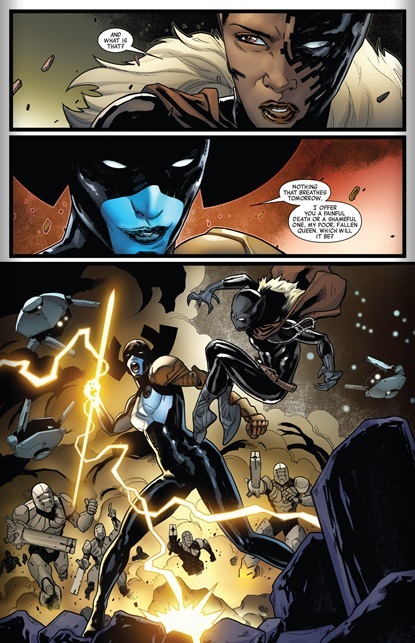 While Reed and T’challa journey to the Wakandan city of the dead Shuri with the aid of Storm and the Invisible Woman fought Anubis in the spirit world successfully. 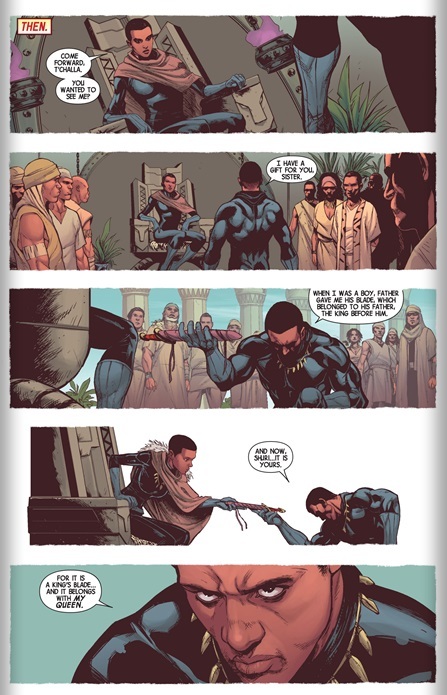 Bast made T’challa the king of the dead and Shuri Queen of Wakanda at this time [Fantastic Four #608]. 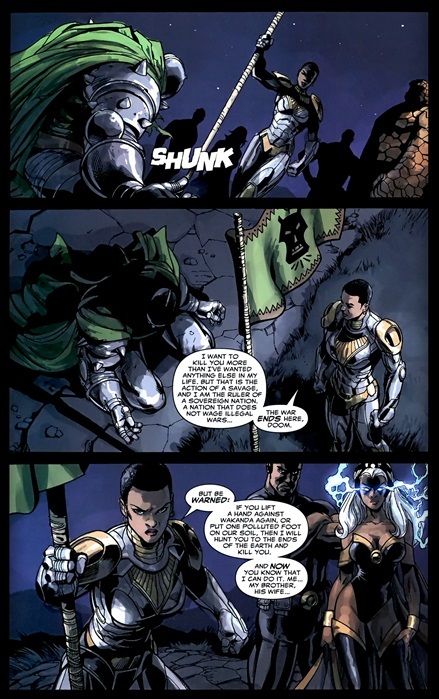 After her coronation her brother T’challa gives to her the ceremonial Wakandan dagger which signified that she was now the Queen of Wakanda as it had been handed from ruler to ruler from the time of Bashenga [New Avengers #40, 2015]. During the events of Avengers vs. X-men she was present when Namor ally of her sister-in-law Storm flooded the capitol city killing hundreds. Shuri and the high council annulled Storm’s marriage to T’challa and branded her a wanted criminal blaming her for choosing the X-men over her family and loyal subjects [Avengers Vs.X-men #8 and Avengers Vs. X-men #9]. Shuri reinstates the Hatut Zeraze and moves Wakanda into a more militaristic stance. She also opens the Wakandan school for Alternative studies. Notable students include Asha, Bull and Blocks [Infinity: The Hunt #1]. For Namor’s actions Shuri is counseled to declare open war between Wakandan and Atlantis as both countries see losses in their escalating tensions. T’challa attempts to steer her in a direction of less bloodshed but Shuri will have none of it and commits even more manpower to the war effort [New Avengers (2013) #7]. Shuri’s war effort is effective as Atlantis is completely destroyed and the survivors scattered [New Avengers (2013) #10]. During Infinity Shuri and her forces effectively defend the nation from Thanos impending fleet [New Avengers (2013) #8 & New Avengers (2013) #9]. The Wakandan School for Alternative Studies is destroyed in this first battle [Infinity: The Hunt #2]. Disappointed in the failure of his army Thanos sends more forces and Proxima Midnight, his most skilled warrior to Wakanda to make a dent in their defenses. They are effective in coming to a standoff. T’challa’s absence is noted. The villains then turn their attention to the Wakandan City of the Dead [New Avengers (2013) #11]. In the aftermath of Infinity When T’challa’s meetings with Namor are disclosed to her by the Dora Milaje Shuri forbids him from entering the city [New Avengers (2013) #12]. Shuri was a far different ruler than her brother and as such bargained with Eaglemore, a rogue US general to conduct illegal research on American soil in defiance of International Law [Daredevil #6-7, 2014]. When three women drew attention to the operation she had them extradited for crimes to her nation. This drew the attention of the American vigilante Daredevil/Matt Murdock. He infiltrated Wakanda then played possum to be brought before her. The two then had a sparring match before Daredevil explained how he had exposed Eaglemore’s secrets to the US military. With the risk of starting an international incident she backed down and allowed him and the nuns to leave her country [Daredevil #7, 2014]. As the Incursions threatened creation itself Namor, her hated enemy unleashed the Cabal to do that which her brother could not [New Avengers #23, 2014]. Namor could not control them however and they were unleashed on a weakened Wakanda. For eight months a war waged between the Wakandans and the machines of Inhuman prince Maximus combined with the wrath of Thanos. 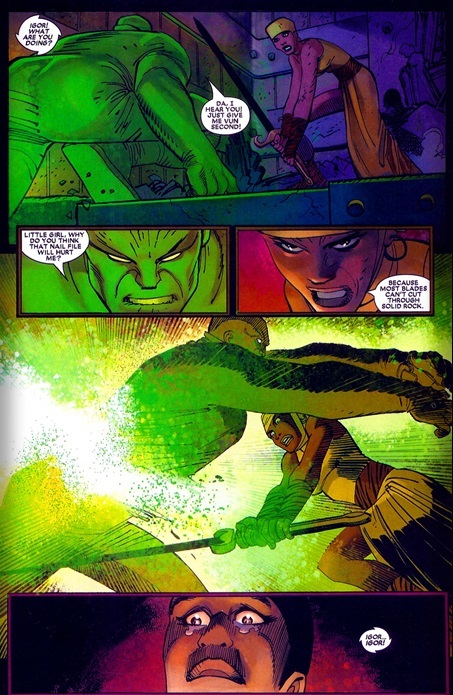 Allied once more with her brother T’challa they tried to put an end to the Cabal but failed. Proud Wakanda now reduced to ash and rubble Shuri relinquished the ceremonial dagger to T’challa as all of Wakanda was now a City of the Dead, a Necropolis. As she handed it to her brother she beckoned him to put the dagger where it belonged, suggesting it be use to kill Namor [Avengers #40, 2015]. She then had her brother teleport away as she faced Prixima Midnight and her army. Clearly outnumbered Shuri died a death worthy of a Wakandan Queen, the death of a true Warrior [New Avengers #24, 2014]. In the aftermath of Infinity war she is found by her brother T’challa unbeknownst to her mother Ramonda or the nation. He tries to resuscitate her to no avail [Black Panther 2016 #1]. Despite her apparent death her consciousness journeyed through a place Wakandans call The Djalia which is plane of collective Wakandan memory training with and learning from a Griot in the form of her mother. She woke up dramatically changed from the ordeal with all white hair, increased knowledge of Wakandan history, magical abilities and brand new attire [Black Panther (2016) #2-9]. She visits her injured mother and then advises the war council on how to deal with the rebels lead by Tetu and Zenzi. She later visits Aneka of the Midnight Angels after she flees from the Jabari Lands and Ayo [Black Panther (2016) #9]. I hate how they took the strongest black male character out there and made it a woman. SMH! That “Black male character” your referring to is still around. This is his sister. I loved reading Shuri’s adventures. Her character had an arc, she grew and evolved. T’Challa is one of the greatest characters ever, a real super man, and for anyone to follow his act it was going to have to take a hell of an effort. Shuri got better and better. I fell out of reading comics at the end of Doom War, so finding out what she did after that was wonderful. Her development of “blood lust” seems like a bit of a back step, as overcoming her impulsiveness and fiercer tendencies was part of her development before Doom War, but if the stories were handled well, it could still be good. I want Marvel to treat this character with some respect. She had a cool debut, a great rise, and is an important part of the Universe. I hope she’s around for a long, long time, and not just shoved into the background, or made a villain for her brother to overcome. Marvel did a lot worse to Shuri recently. Yeah, I just read the Daredevil arc where she is responsible for buying illegal weapons from the American military. A real “protect my people at all costs” story, and Waid is normally a much better writer than that, better at getting to the heart of a character. Here, he used her like a shadowy background character from the X-Files… but with panthers and her own country to hide behind.